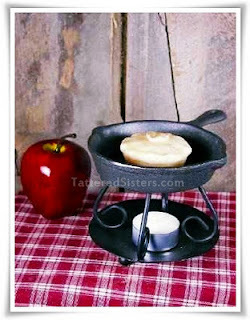 I have some wonderful Iron Skillet Wax Warmers that I am listing for sale. Brand new and perfect for gifts this holiday season. These are available via Google Checkout using the Add to Cart button below for $12, plus $6.95 shipping for one warmer. Each warmer will come with a tealight candle and one wax melt. Note that the wax melt you receive will vary from what is shown in the photo. Google Checkout (now known as Google Wallet) is highly secure; I have used it myself for years with never a problem. You will need to register to purchase with their cart. I do not have access to your credit card information using Google and it is not stored on this blog. However, if you'd prefer to purchase using Pay Pal, I can send you an invoice or you can send me $18.95 directly in Pay Pal (which includes the cost of shipping). You can use artchickstudio at gmail dot com as the email address. If you'd like for me to send you a Pay Pal invoice, just click on my Contacts link at the top of the blog and shoot me an email that includes your Pay Pal email address. 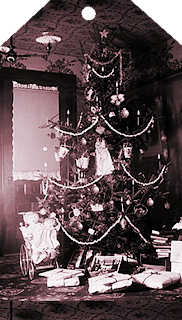 With the holidays upon us, I thought I would share some Primitive Recipes in December for country and Primitive Bath and Body products you might like to make yourself and give as gifts. It's still November as I type this, but I'll try to add a couple more recipes next month. I'm starting with a Milk Bath recipe. 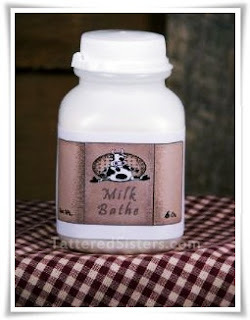 I made a few different types of Milk Baths when I had my retail store and online store too. You can easily Google "milk bath recipe" and get lots of ideas. But the three I'm listing below will give you a place to start. And my photos show you a couple of ways that I packaged my Milk Bath powder. Process the Oatmeal in a blender or food processor. And Milk powder and mix. Pour into a bowl and add the remaining ingredients, and mix well. This makes about 4 cups of Milk Bath. Combine all the ingredients in a bowl until they are well blended. This makes about 2 Cups of Milk Bath. Note of caution: dry buttermilk can be stinky! This is not meant to a fragrant bath--it's designed for skin-softening only. You could always increase the dry milk and decrease the buttermilk if you find the buttermilk's odor too overpowering. Mix the milk powder and the salt, then add the fragrance and mix until well combined. 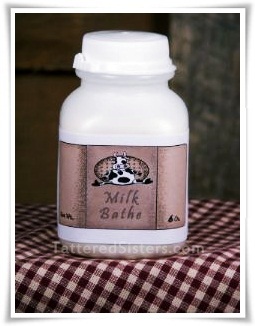 Directions for use of Milk Baths: Use 3 TBSP or more to bath water to smooth and soften your skin. 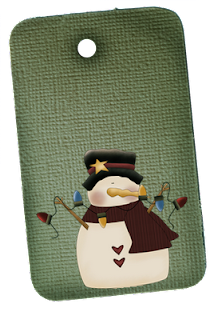 I got a request from a prim sister at A Primitive Journey community for a primitive hangtag with a snowman on it. 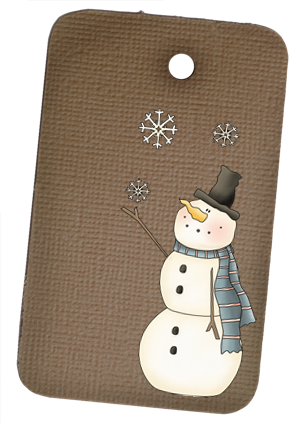 So after playing around a bit I decided to do one better and create two Primitive Hangtags with snowmen! Just click on the images below to view them full size. Then right-click and save them to your computer! As always, these Primitive Freebies are free for your personal, non-commercial use. They are not to be used for resale purposes. And thanks to Gail at Country Life Graphics for the perfect and adorable Primitive Snowmen graphics! A reader asked me for some ideas for using Vintage Wooden Spools today. I put a lot of thought into it, and made good use of Google, and found lots of inspiring ideas. So I thought I'd share those ideas with all of you, in case anyone else might be interested in this too. 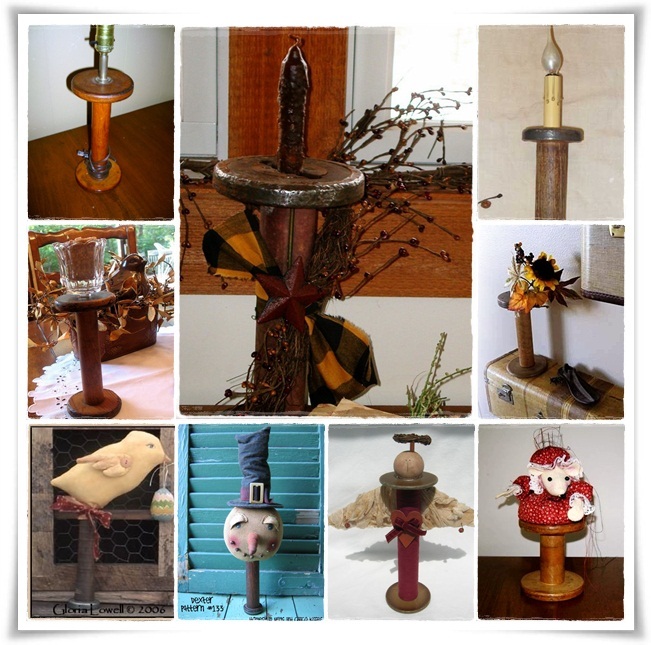 Of course, there can be many other uses for these types of wooden spools. If you have some other ideas, leave a comment and share. Would love to get some more creative inspiration! 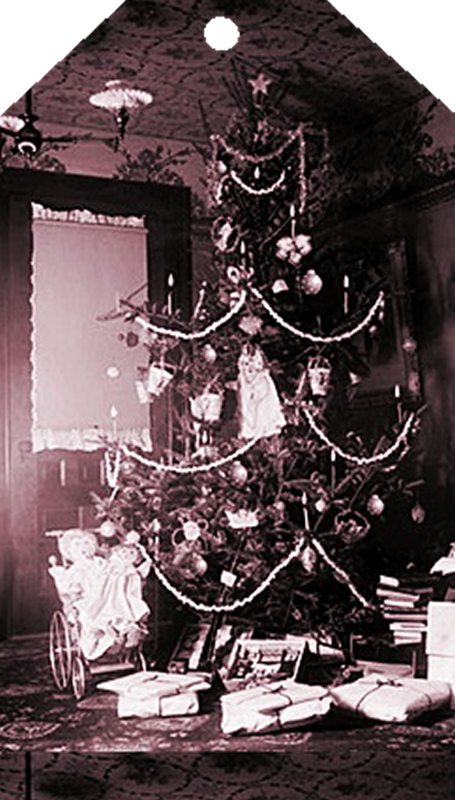 With the holidays upon us, you might be able to use some of these ideas to make some fabulous primitive Christmas gifts! I was in the mood to do something with fabric yesterday. Then I remembered I had some fabric ATC blanks that I hadn't used yet so thought I'd use one of those to create a Primitive Hangtag. First I grungy'd up the tag using some Tattered Angels Glimmer Mist--always a nice, quick way to add a grungy effect. Then I stamped on a Primitive Crow design. I added some homespun across the top portion using some black paper fasteners, and I added one to the crow too to look like an eye. Then I added some extra homespun to the top of the tag and added a little spring of Pip Berries too. I love the way this turned out. It will be perfect for a primitive gift this holiday season! Just one more Primitive Freebie for today. 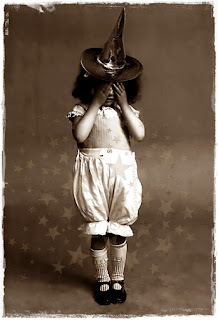 I've been going through all my Vintage Photos and couldn't resist playing with this one too for a freebie. 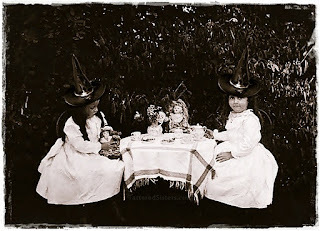 A Little Witches Tea Party photo for you. 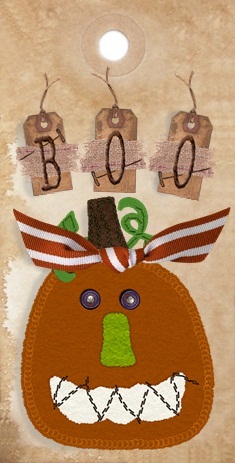 That's just too cute for a Primitive Halloween craft project or gift tag. Just click once on the image to open it to its full size, then right-click on it to save it to your computer. And as always, this is free for your personal use only...it may not be used or sold for profit. 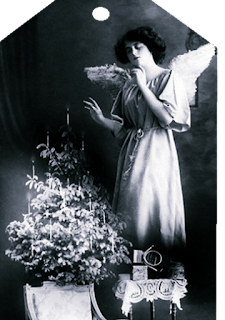 OK, so I'm in digital mode right now and felt like playing with some vintage photos to make some more Primitive Freebies for you for October and that will be a perfect touch for your Primitive Halloween crafting...especially if you love to use Vintage Photos in your crafting like I do. This first one is called Peek-a-Boo Witch. As you can see, it's a cute little witch girl playing peek-a-boo. 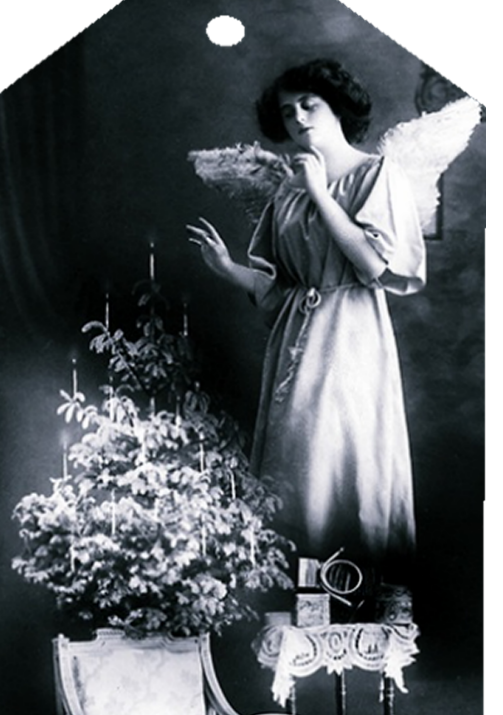 I've added a couple of digital elements to jazz her up a bit for the holiday. 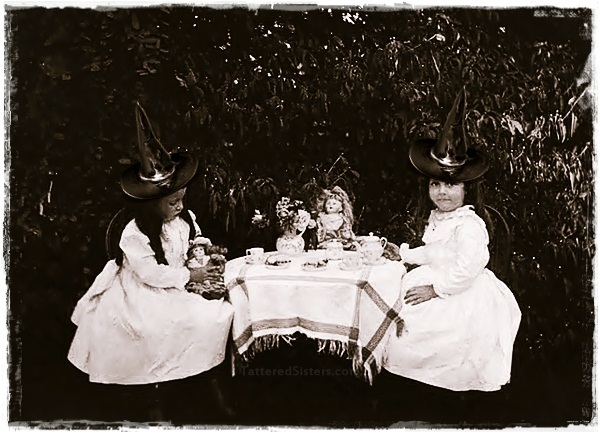 This was such a cute image I couldn't wait to do something with it, so though a witch hat would be perfect for Halloween. Who knows...maybe she's playing Hide and Seek with some little witch friends. Click on the image to enlarge it to full size, then right-click to save it to your computer. And, as always, this image is free for your personal crafting needs. But it is not allowed to be used or sold for profit. I love Primitive Freebies, don't you? 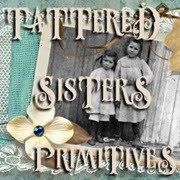 That's why I like to make some freebie hantags and Primitive Graphics to give away here at Tattered Sisters from time to time. And since it's still Fall, I'm sticking with pumpkins. 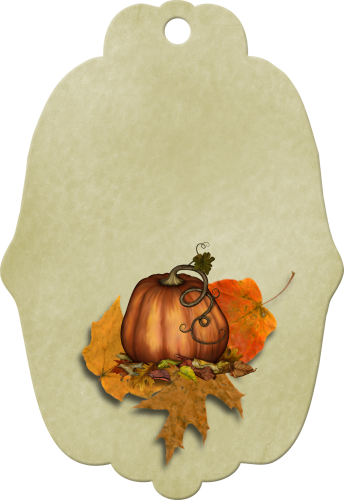 So I've created this Pumpkin Jack Tag freebie for you. Click on the image to open it full size. Then right-click on the image to save it to your computer. Remember that my freebies are free for your personal use only. They cannot be used for commercial purposes/resale for profit. Hope you like it. Enjoy! These make the perfect Primitive Gifts, great as hostess gifts or just something to surprise a friend. You will also need your choice of Mason Jars and some raffia for the jar lid. You don't need any precise measurements for this recipe. It's really just about layering each of the ingredients until you get to the top. 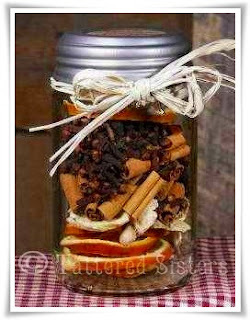 I always start with 3-4 orange slices, then add a few pieces of ginger root, then the cinnamon sticks, cloves and allspice. 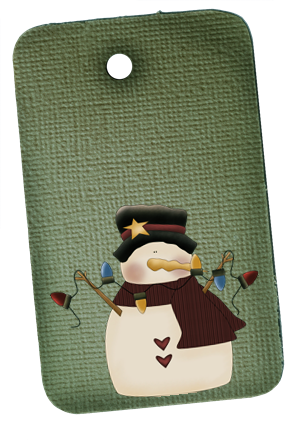 I also add either a hangtag to the back, or a sticker to the bottom with directions for simmering. They can be added to a simmering potpourri pot, or to an old pot on the stovetop. Notice I don't add any fragrance oil to this recipe; it's all natural so it can't hurt the pan used for simmering. The ingredients just need to be covered with water and simmer on low--remembering to always check the water level! The smell is fabulous. Perfect for fall. Note: I don't dry my own orange slices. 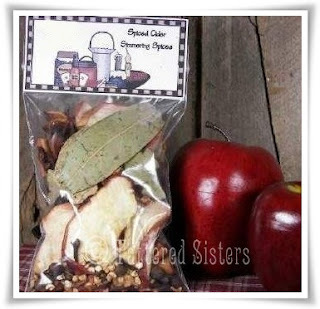 I buy all my ingredients from suppliers listed on my Primitive Crafting Supplies page. I love Prim Fixins, as so many of us do. I always have some sitting around in a bowl or a jar somewhere this time of year, especially if they are filled with all the colors of Fall. 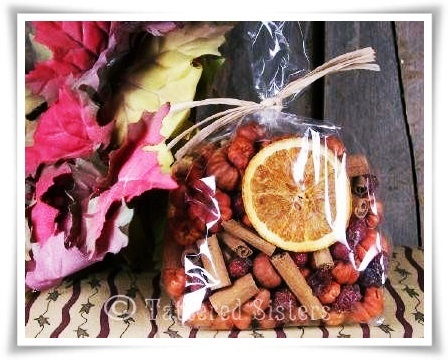 So I thought I'd just show you a little packaging idea for giving some Fall Fixins as a gift (or even to sell). You can use any Fixins you like, of course. But in the photo I've just used rosehips, cinnamon sticks, and putka pods, scented in Pumpkin Pie scent. I've also thrown in some dried orange slices for an extra pop of color. They always look so nice in a bowl with the fixins. Of course, you could add Dough Ornies if you like to add another prim touch. Then I just put it all in a clear cello bag and tied it with some raffia. 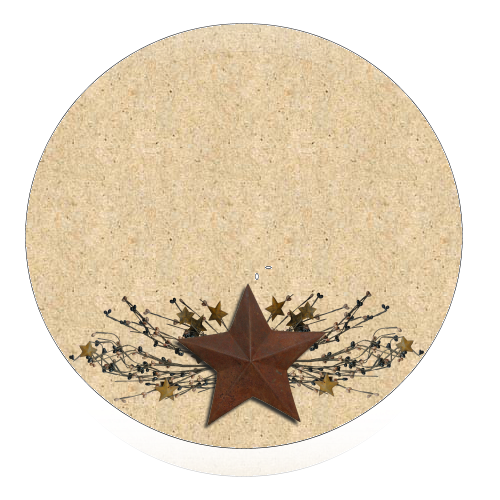 You could use the tried and true primitive standby, homespun, because that always looks cute and prim. I also always put a tag on the back with a little caution notice about the fragrance oil, since it really isn't meant to be in contact with painted or finished surfaces. You could also put these in a jar, like I did the Primitive Putkas in a Jar. That always makes for a great presentation. No matter what you do with your fixins, they are a great touch for your Primitive Fall decor. I spent the day with the Hubs doing a little shopping on Saturday, and I was so lucky to come across a great Primitive Find at Hobby Lobby. It's this wonderful country Primitive Birdhouse. How is that for cuteness? The colors are exactly what I love for my Primitive Home Decor, whether it's inside my house or outside. For now I've got this sitting on an old milk can on my side porch. I may move it at some point, but for now I am just going to live with it there for a bit and see how it fits. OK, so I guess I really must have pumpkins on the brain! But hey, it's Fall, right? If it were February, then I would be worried about this old brain of mine. I decided to make this Grungy Primitive Pumpkin Ornie out of felt. I drew a pumpkin shape and traced it onto cardstock to create my Primitive Pumpkin pattern. I used that to cut two pieces of felt into my pumpkin shape. Then I sprayed my felt shapes with Tattered Angels Glimmer Mist, in Coffee Shop color. It's a great, quick way to add a grungy effect if I don't feel like messing with my usual Grungy Sauce mixture. And it's great for small projects like this one, which is only about 3-3/4" long. You know how much I love Grungy Goods by now, so making stuff grungy is always fun for me. And it's perfectly primitive too! After drying the felt it was time to add the face. I used buttons for the eyes, and a scrap of gingham homespun for the nose. Then I just sewed on a crooked little smile. To the back half of the pumpkin shape I sewed on a piece of cinnamon stick to be the stem. Next I started sewing the pumpkin body together, until I got 3/4 of the way done. And then I stuffed the body with fiberfill and sewed it closed. Another cute and fun project to add to my collection of Primitive Ornies. I am going to be in Primitive Fall mode until after Thanksgiving, I'm sure. That's about how I roll anymore. So I'm doing as much Fall crafting as I can (though sometimes, that's not as much as I'd really like!). This time I'm serving up some Pumpkin Jack Dough Ornies. Dough Ornies have always been a favorite of mine, so it's fun to make them for every season, don't you think? 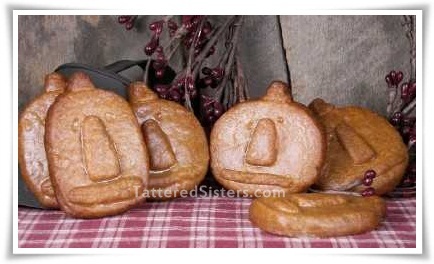 These Pumpkin Jacks are about 2-1/2" to 3" around. These could easily work well thrown in a bowl of Prim Fixins. They are great as actual hanging ornies too; you can even add them to the top of a gift box. 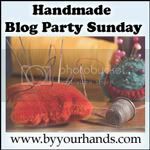 I use silicone candle molds to make them (and in case you're wondering, I don't remember where I got the molds). And these are just made with my Primitive Dough Recipe. You could also paint them. Or you could save yourself some work and add powdered orange tempera paint to your dough before baking and then the pumpkin jacks will already be orange when they are baked. That's a real time saver! Then all you'd have to paint really are the features. But heck, they're primitive, so you don't have to really paint anything! One more tag to post for today. 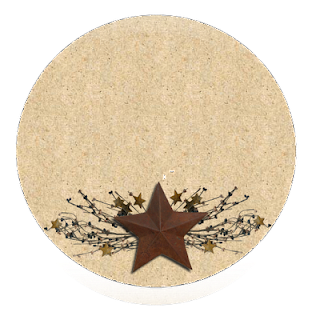 Since I usually do the usual rectangular tags, I decided to make a round one this time and I used Rusty Tin stars as my inspiration for this Primitive Hangtag. And hey, some Pip Berries always add that little touch of primitive we all love too. Click on this tag to open it to full size, then right-click and save it to your computer. There's not pre-set hole at the top of this tag, so you'll have to punch one yourself. Sorry about that! And again, please remember that my freebies are for personal use only. I haven't been too super crafty the last week or so, but wanted to add something to the blog. So I decided to create a couple of Primitive Hangtags to add to my Primitive Freebies category. This first one is just in time for any Primitive Fall gifts you might want to give. Click on the image to view the full sized version of the tag. Then right-click and Save the image to your computer. Also just a reminder...my freebie graphics are NOT for commercial use. They are free for your own personal use, but they are not intended to be reproduced for sale or profit in any way. I am creating these as a kindness. It takes time a good deal of time and care to create them, and I am happy to do so. But only if you are taking them for personal use. If I start to see my custom tags appear for sale on any websites, I'll have to stop making them, and I would hate for that to happen. So please respect my wishes where these freebie graphics are concerned, so that everyone can continue to enjoy them. Now I don't tend to do a lot of Primitive Halloween crafting. I much prefer Primitive Fall crafting instead. But I was creating some other bags to post on my Art Chick Studio blog and came up with this to post here for my prim sisters. It's my Grungy Boo Bag. By now you know how much I love to create Grungy Goods, so any time I come up with something to add to my collection of grungy ideas, I'm a happy camper. 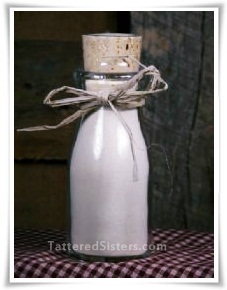 I used my Grungy Sauce Mix recipe that I posted in my Grungy Hang Tag Tutorial to grungy up a plain muslin bag. Then I just used black ink to stamp a spider image and lettering on the bag, to spell out BOO! These would be perfect as little treat bags; fill them with candy corn or any kind of sweet treat. They would also be great as bowl fillers or hanging off of a peg rack, or sitting on a shelf. And of course you could stamp them with all sorts of designs and saying, and you could dye the bags different colors. There are lots of possibilities! Now this was just totally for fun, because I was determined to find another way to use my putka pods AND create another Primitive Fall project. The result is my little Primitive Pumpkin Bucket, accented with the cutest of Primitive Crows. I started with a plain mini black bucket, approximately 2" or so in diameter at the top. I added some fiberfill to the bottom and covered that with a piece of cardboard that I cut to fit very snug inside the bucket, just below the ridges on the bucket. I shoved in the cardboard and the ridges basically hold it in place. I did this because I knew I'd be hot gluing the putka pod "pumpkins" in, and I didn't want to have to do more than necessary. Those little suckers are small, and that takes a lot of time! So the fiberfill and cardboard barrier gave me a way to use less putkas. Next I took my primitive crow pick that I bought at Blossom Bucket (probably 3 or 4 years ago!) and cut the wire to the length I needed, so that the crow would sit a bit above the top of the bucket. I poked it through the cardboard and fiberfill where I wanted it to be. Then I started hot gluing in putka pods, one at a time. I just kept going until I created a nice little mound, and made it look like the crow was perched on the pumpkins. To finish it off I just shoved in some Spanish moss here and there, to make it look like hay or something dried. And I tied a piece of jute around the bucket to help offset the black of the bucket and give it a bit of a rustic touch. I just love how this turned out.